Hectic efforts by the USA to set up a Vajpayee-Musharraf meeting here on the sidelines of the SAARC summit have suffered a fresh setback with Islamabad contending that there was no evidence for taking action against the 30 terrorists named by India in a list submitted to Islamabad a few days back, a senior Indian official said here today. The Department of Civil Defence is conducting regular exercises in Karachi to prepare citizens in case of an Indo-Pak war. The head of intelligence under the toppled Taliban regime in Afghanistan has been killed in the US bombing raids, an official of the new government in Kabul told CNN today. Officials in the southern Afghan city of Kandahar, former powerbase of Taliban leader Mullah Mohammad Omar, said on Wednesday negotiations were under way to try to capture the fugitive cleric without bloodshed. 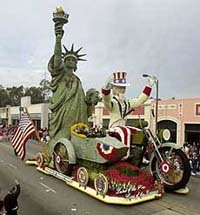 "Land of the Free, Home of the Brave," a float featuring Uncle Sam and Lady Liberty," sponsored by the Veterans of Foreign Wars makes its way down Colorado Boulevard during the 113th Rose Bowl Parade at Pasadena, California on New Year's Day. The float won the Most Spectacular in Showmanship and Dramatic Impact Trophy. Lady Liberty's surface is composed of more than 50,000 eucalyptus leaves. Soldiers have gunned down seven Maoists in Nepal as the authorities stepped up security in Kathmandu ahead of a South Asian summit which gets under way later this week, the Defence Ministry said on Wednesday. The Sri Lankan Government today eased the economic embargo imposed on the LTTE-controlled Wanni areas in the island’s North in an effort to promote dialogue with the Tamil Tiger rebels. Israeli Foreign Minister Shimon Peres will discuss bilateral, regional and international issues with Indian leaders and seek New Delhi’s “active support” in the West Asian crisis during his five-day visit to India next week. Two journalists who wrote stories about corruption were allegedly attacked by supporters of Prime Minister Khaleda Zia and three others received death threats on New Year’s Day, their newspapers reported today. Argentina’s new president Eduardo Duhalde, the fifth leader in two weeks, has said in an inauguration speech that he would form a government of national unity to help deal with massive economic and social chaos. 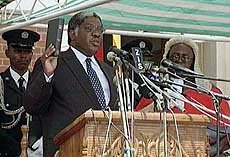 Zambian ruling party candidate Levy Mwanawasa was sworn in as the country’s President today. “I, Levy Patrick Mwanawasa, having been elected president of the Republic of Zambia, do swear that I will faithfully and diligently discharge my duties...in this high office,” Mr Mwanawasa said in accepting the oath of office. The youngest son of former Indonesian dictator Suharto tried to buy a presidential pardon for almost $ 2 million to escape charges of corruption, his lawyer said today. “Where is the ground for a meeting between Prime Minister Atal Behari Vajpayee and President Pervez Musharraf when Pakistan refuses to act against the terrorist groups operating from its soil against India and continues to promote cross-border terrorism,” he said. In this connection, the official drew attention to yesterday’s statements emanating from Islamabad in which Pakistan said it had no proof against any of the terrorists named in the list provided by New Delhi. Pakistan had also yesterday stated that both Jaish-e-Mohammed Chief Maulana Masood Azhar and Lashkar-e-Toiba’s Amir Hafiz Mohammed had been taken into preventive custody and not formally arrested as there was no evidence of their involvement in the December 13 attack on the Indian Parliament. US diplomats in Nepal are also said to be actively engaged in hectic parleys with delegations of the two estranged neighbours to persuade them for a bilateral dialogue with a view to defuse tension on their borders. A State Department spokesman in Washington yesterday stated that the SAARC Summit was a good opportunity for India and Pakistan to make progress towards resolving their bilateral differences. “We are in touch with both these countries and are encouraging them to have a dialogue on all outstanding issues and use dialogue as means to resolve their differences,” he said. While Indian Foreign Secretary Chokila Iyer refused to have any bilateral meeting with her Pakistani counterpart Inam-ul-Haq, the possibility of a dialogue between External Affairs Minister Jaswant Singh and Pakistan Foreign Minister Abdul Sattar also receded following Pakistan’s volte-face on the issue of dealing with terrorist groups. The Indian official said any hand-shake or exchange of pleasantries between the two Foreign Ministers could in no way be termed a structured meeting. “We have no problem in sharing podium with the Pakistanis if it is in the overall interest of the region,” he said. Meanwhile, Pakistan has said it will consider extraditing 20 terrorists wanted by India provided New Delhi gave evidence against them and took recourse under the SAARC Anti-Terrorism Convention. “We can consider the extradition of these persons, only after India meets all the legal conditions,” Pakistan Foreign Minister, Abdul Sattar told Pakistan reporters in Kathmandu last night. He said to meet the legal requirements for extradition, India would have to make a case against each listed person in its own courts, provide evidence that would help indict these persons and ask for extradition under the SAARC Anti-Terrorism Convention. Mr Sattar, who is attending the SAARC Foreign Ministers Conference, said India could invoke the right of extradition after completing the procedures and providing evidence, Pakistan daily The Nation reported. Reacting to queries on the list of 20 terrorists wanted by India, the Foreign Minister said the issue of their extradition should be seen as a legal issue and not a political one. “India should first fulfil all the requirements and conditions for the extradition of wanted people. Then it should clarify under which law it calls for the extradition of these people from Pakistan,” he said, adding that New Delhi had not so far justified its request for extradition. “We cannot hand over any person to India until it justifies the extradition,” he said. “Qari Ahmadullah has been killed by US bombs at Zadran in Khost province,” Abdullah Tawheedi, a deputy head of intelligence in the interim administration, told CNN. Tawheedi said the death occurred two or three days ago as US warplanes continued operations to crush the Taliban for harbouring Osama bin Laden and his al-Qaida network blamed by Washington for the September 11 attacks on USA which killed nearly 3,300 people. Tawheedi said people had identified the body, and Ahmadullah’s remains had been buried in his hometown in Ghazni province, according to CNN. Tawheedi said Ahmadullah was in the home of Mullah Taha, a Taliban commander, when the house was hit by US bombs. He said two of Taha’s sons were also killed, but Taha escaped. “This area belonged to the Al-Qaida network and the Taliban,” Tawheedi said. Taha’s current whereabouts are not known, he said. Tawheedi said he had received reports that another Taliban commander, Mullah Abdul Salam Rocketi, had been killed in the same raid. But he had no independent confirmation. Ahmadullah was notorious for his and his subordinates’ torture methods and cruelty, including flogging with thick cable and the use of electric shocks, CNN said. In the meantime, The Chairman of Afghanistan’s interim government, Mr Hamid Karzai, said he wanted the US bombing of Afghanistan to continue until all terrorist activity was rooted out, but also expressed concern about mounting civilian casualties. “We want to finish terrorists in Afghanistan — we want to finish them completely,” he said. “But we must also make sure our civilians do not suffer,” he said in an interview with the New York Times published today. Asked when the civilian cost would become too high to justify the bombing campaign’s continuation, he said, “We must make sure there is no civilian cost at all”. Mr Karzai’s comments came in the light of reports that up to 100 villagers had been killed in overnight strikes on Saturday. “We are still in contact with the people there to find a way to end this issue peacefully,” said an official working for Kandahar intelligence chief Haji Gullalai. “I think we can achieve this goal through dialogue and discussion,” he told Reuters. Mr Gullalai is hunting the reclusive supreme leader of the vanquished Taliban, who is believed to have taken refuge with 1,500 die-hard fighters near the town of Baghran in southern Helmand province, some 160 km north-west of Kandahar. About 200 US Marines have also been scouring a suspected hide-out in southern Afghanistan as the US forces hunt for the world’s most wanted man — Osama bin Laden — his Al-Qaeda fighters and the Taliban who gave him protection in their rugged and landlocked country. “There is no fighting now and the local people also don’t want destruction and death,” the official said. Mullah Omar is second only to Bin Laden on Washington’s list of most wanted men and, since 1996, had provided a home to the Saudi-born millionaire militant accused of masterminding the airliner suicide attacks on September 11 that destroyed the World Trade Center and sliced into the Pentagon, killing about 3,000 persons. The USA is holding 210 Taliban or Al-Qaida detainees in Afghanistan and on a US naval ship in the Arabian Sea, a Pentagon spokesman has said. The majority of them — 189 — are being held at a detention centre in the southern city of Kandahar, Pentagon spokesman Lieut Col Rivers Johnson said. The ministry said in a statement that five guerrillas were killed on yesterday in a gunbattle with the security forces in Kanchanpur district in far west Nepal. One insurgent was shot dead in Banke district while trying to flee from custody and another was killed in a search operation in Bardia district, also in western Nepal. Maoists are fighting to topple the constitutional monarchy and trying to set up a one-party communist republic in Nepal. The ministry said 38 guerrillas were arrested and soldiers also seized a large amount of weapons and ammunition from the rebels who derive their inspiration from Peru’s Shining Path movement. Nepali troops have launched operations to flush out insurgents from their remote mountain hideouts after the government imposed an emergency in the country following a string of attacks on security posts in November. The newly-elected UNP government led by premier Ranil Wickremesinghe has now allowed all categories of goods, except 10 items, to be carried to Wanni, the Defence Ministry said in a statement. The banned goods include unlicensed arms and ammunition, unlicensed explosives, remote-controlled devices, barbed wire, binoculars, telescopes and penlight batteries while the articles to be issued with restrictions are diesel, petrol, cement and iron rods. The logistical arrangements to ensure the smooth implementation of this decision are currently being worked out and will be in place within the next two weeks, the statement said. Severe restrictions on the free flow of food, medicine and other essentials to Wanni and Batticaloa areas were imposed by the previous People’s Alliance government in 1994.
he UNP government, which has received an overwhelming mandate for peace from all sections of the people, has taken this decision to uplift the living standards of people of wanni area and bringing about an atmosphere conducive to invigorating the peace process, the statement said. Mr Peres, former Prime Minister, will reach New Delhi on Monday and hold meetings with External Affairs Minister Jaswant Singh and is also expected to meet Prime Minister Atal Behari Vajpayee, Home Minister L.K. Advani and other senior political dignitaries during his third trip to India in just about over one year. “Israeli Foreign Minister is visiting India at the invitation of External Affairs Minister Jaswant Singh’s invitation when he visited Israel in June 2000. The reciprocal visit is part of the high-level dialogue between the two countries to boost bilateral ties while exchanging views on bilateral, regional and global issues of mutual interests,” Indian Ambassador to Israel R.S. Jassal said. “The past year was dangerous for us. The new year does not look better either,” said Aktar Ahmed Khan, a spokesman for the Dhaka Union of Journalists. At least 40 journalists have been attacked or threatened with death since Ms Zia’s four-party coalition swept the October parliamentary elections, according to local and international media watchdogs. In the altercations yesterday, a gang of Ms Zia’s supporters allegedly beat up and injured Humayun Kabir, a reporter for the Ittefaq newspaper at Muladi town in Barisal district, south of Dhaka. He was assaulted after writing a story alleging that supporters of Ms Zia’s Bangladesh Nationalist Party were running illegal gambling operations. The injuries were not life-threatening. Dhaka-based Ittefaq, the country’s largest Bengali-language daily, also said its reporter Kamal Uddin escaped unhurt after angry members of Ms Zia’s party tried to abduct him at Chagalnaiya town, his base in eastern Feni district. “My commitment from today is to finish with an economic model that has brought desperation to the vast majority of our people,” Dr Duhalde told Congress yesterday after a special session elected him president until 2003. In a speech littered with criticism of free market policies, Mr Duhalde, from the populist wing of the Peronist Party, said Argentina would only be able to honour its $132 billion foreign debt when the economy, which is in its fourth year of recession, began growing again. Gruelling recession and street protests sparked the resignations of two incumbents in quick succession. Two other interim presidents also briefly ran the country. Duhalde said he would announce his new economic programme on Friday. Zambian ruling party candidate Levy Mwanawasa was sworn in as the country’s President today. “I, Levy Patrick Mwanawasa, having been elected president of the Republic of Zambia, do swear that I will faithfully and diligently discharge my duties...in this high office,” Mr Mwanawasa said in accepting the oath of office. Earlier, a Zambian judge cleared the way for the swearing in, rejecting an Opposition bid to force a ballot recount in last Thursday’s closely fought presidential election. Zambia’s 10 opposition parties have accused the ruling Movement for Multiparty Democracy (MMD) of rigging the polls in favour of Mr Mwanawasa. The MMD and the Electoral Commission have denied the allegations. Meanwhile, former President Frederick Chiluba said he would step down soon as president of the ruling MMD, clearing the way for his successor to take his place. “I will relinquish my party presidency. You will be your own man,” Mr Chiluba said at the inauguration as president of his chosen heir, Levy Mwanawas, who won a closely fought election. Lawyer Elza Syarief admitted that Hutomo “Tommy” Mandala Putra had handed (almost $ 2 million dollars) to two men said to be close to former President Abdurrahman Wahid in October 2000.